China in the airport and Shanghai! At the airport day 2 waiting to get on the airplane. We had $12 in Delta voucher for breakfast and considering we had already eaten breakfast at the hotel for free, we decided to just get something else to eat. So for two fruit cups and a bottle of water at Starbucks, it costed $11.40 on Delta. Whoohoo!! We arrived in Shanghai on Sunday, August 28 around 6:40pm and got onto the Line 2 subway by 7:18pm. It took 1 hour (8:18pm) to get to Nanjing East Rd subway stop. The best part was it took about 2 minutes to walk to the Nanjing Hotel!! !We then took some time to relax and change into something more comfortable to look around Shanghai.At 9pm, we walked east toward the Bund, and looked at the city life. 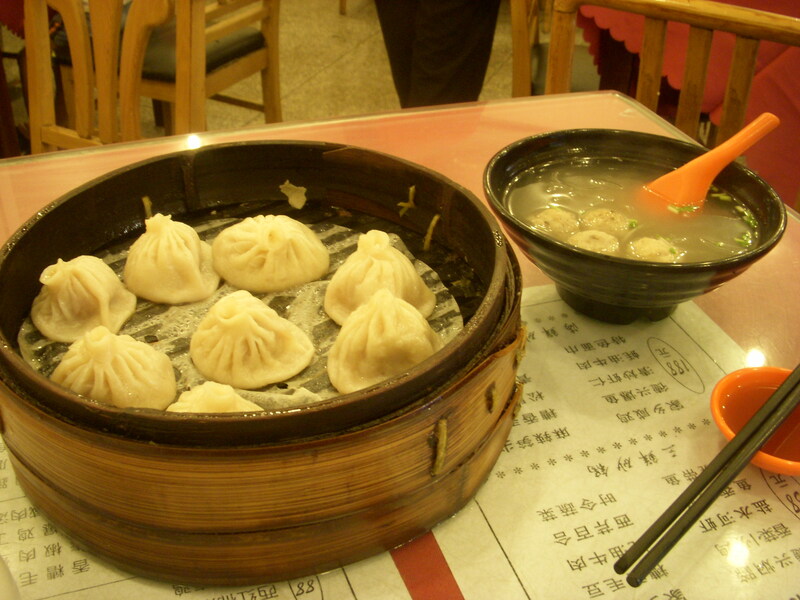 First, we got the ‘pan fried’ bun – 4 for 8 yuan. And Yes, I saw the thing that Sunny got for me. I don’t know if I’ll be able to roll like them but it has inspired me a little bit — especially since it lights up! 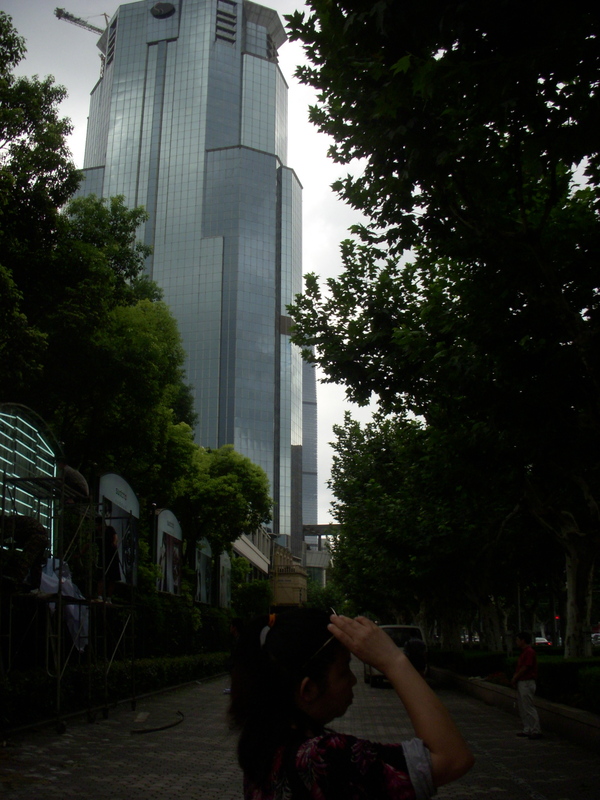 We walked really slowly so we didn’t arrive at the Bund until 9:40ish. In a way, I was surprised by the number of people there!! Many Chinese tourists and foreign tourists alike. Of course, there were some smokers there but since I read about it, I was more indifferent to them. Also, there isn’t such thing as ‘personal space’ either. And staring is ok! haha.The Bund is really nicely lit up at night. We then decided to taxi it over to Xintiandi — “New Paradise” (16 yuan before 11pm). It’s full of foreigners and many young people dressed up! There were many cafes that were so full of energy on this Sunday evening. At 11pm, we got tired and headed back to the East Nanjing Pedestrian Street but starting from the west side (where the People’s Square is) walking west. The lights were still on (as shown in the picture) and much less people were around. The homeless were settling in onto their benches. We headed over to the McDonald’s nearby to try out the internet. It didn’t work! And my phone didn’t work either. Anyway, we tried to order food the ‘proper’ way and was immediately called out as a “old outsider” or foreigner. Haha, just because I used the proper name for the food… and even though I ordered a cheeseburger and a 10 piece chicken nugget, none were available. Only a tiny two piece chicken wing (the size of your pinky!!) and a 5 piece chicken nugget were available. Too bad it didn’t taste that great. At night, we plugged everything in and hopped on the internet. NEXT DAY on Monday, August 29, 2011, we both woke up at 5:45am, despite going to sleep at 2am. We didn’t get up until 7:20am and got ready and left by 8am. At first, we were going to go eat at a ‘little eat’ place two blocks away but…Instead, we were stopped by good soup bun prices! 8 for 12 yuan. And yes, we only took about 4 steps out of the hotel and stopped right in front of the restaurant in front of us. Yes, it is a little bit sad but we did it anyway. 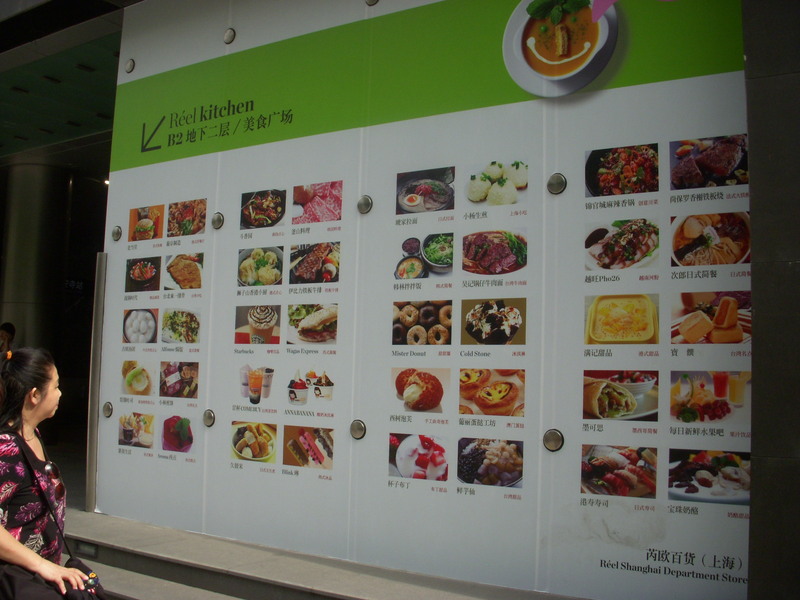 And the soup in the picture was 8 yuan – and just as yummy! I like how the food in Shanghai is not as oily as they make it in the US so good food, good prices — hooray! 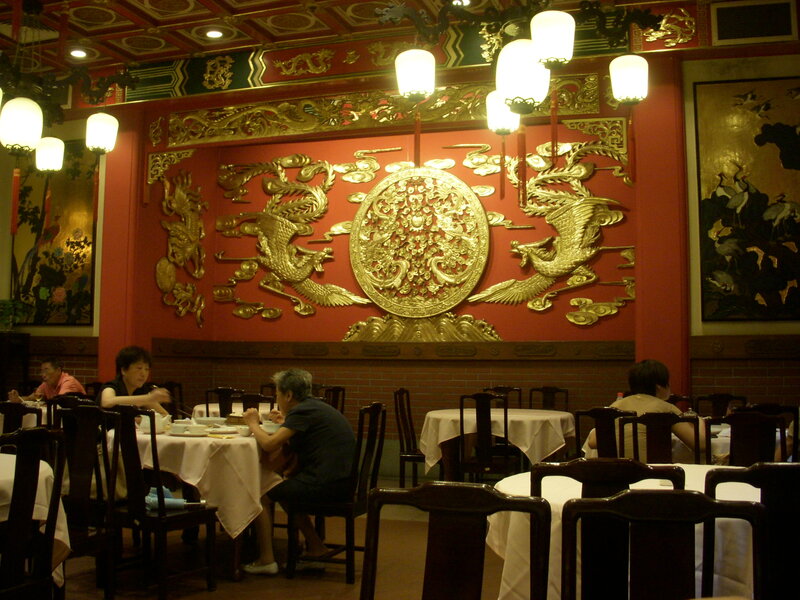 On the right is a picture of an expensive but historic restaurant: Mei Long Zhen Restaurant (1038 Nanjing Rd W). Simple and tasty, we ordered a specialty dish with just shrimp, Ma Po tofu (best one I’ve had! ), vegetables (sad to say that we found HAIR but they quickly replaced it… still scary to see though), and hot and sour soup with sea cucumber, roast pork and other expensive ingredients.Apparently we ‘bought’ the hair towels too and the tea was 12 yuan. At least the bathrooms were western with toilet paper and the decor of the place was amazing!It came out to be 302 yuan — not cheap but we probably won’t go to these really nice places often haha. Honestly, I prefer the cheap but good tasting food!! Better for stomach and ‘piece of mind’. We did make stop at Shen Da Cheng (636 Nanjing Rd E) and bought this warm red bean and other bean cup of food (3.5 yuan) and a meat mooncake. YUMMYAnd we went to McDonalds and got free wifi for 30 minutes! YAY Unfortunately, I also got bite 10 times! BUT at least we went to the drug store to buy anti-itch for 5.6 yuan.We walked past People’s Square, ate a 85 degree (mango thing), and went to ICBC to exchange the travellers’ cheque. NEVER AGAIN. It took over 30 minutes and they charged $11.25 US. Also, since the phone card was bought in Beijing, Shanghai people can’t get access to info there. Retarded. We also shopped around and I got a nice blue and white dress for 139 yuan. Thanks mom!! On the way over to the Jiag’an Temple, the Reel Kitchen ad stopped us in our feet! So many tasty desserts appeared on this ad. Look at mom — she looks happy. Hehehe. Especially about the Taiwanese ice! 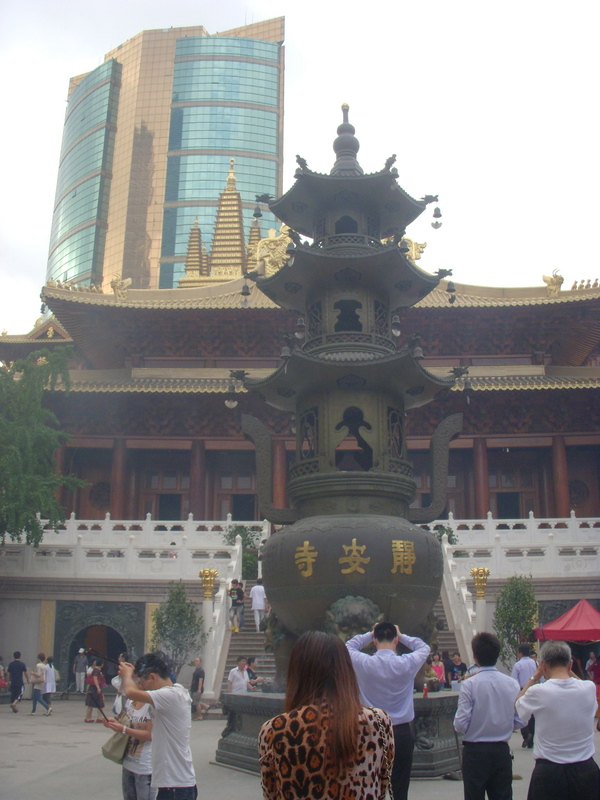 We are inside the Jing’an Temple in this picture. People are praying with incests in a ‘north, south, east, and west’ direction. Many statues are made of gold and we walked into the temple to see Buddha of the past, present, and future. It’s neat how the temple has survived from World War I and II and the drum tower and clock (bell) tower really do have a drum and a bell inside!The girl standing in front — well, I was surprised that even women dressed in high heels, and old and young men, and of course more, all come to say their prayers.And if you throw money into the pot, you shall be protected. But I’m not sure if I believe that. Thankfully, by this time, we were tired and the B2 was connected to the Line 2 subway. We paid 3 yuan each for a stop only 3 stops away and headed back to the hotel. We saw a couple eating fruit so we couldn’t resist and had to get some too! 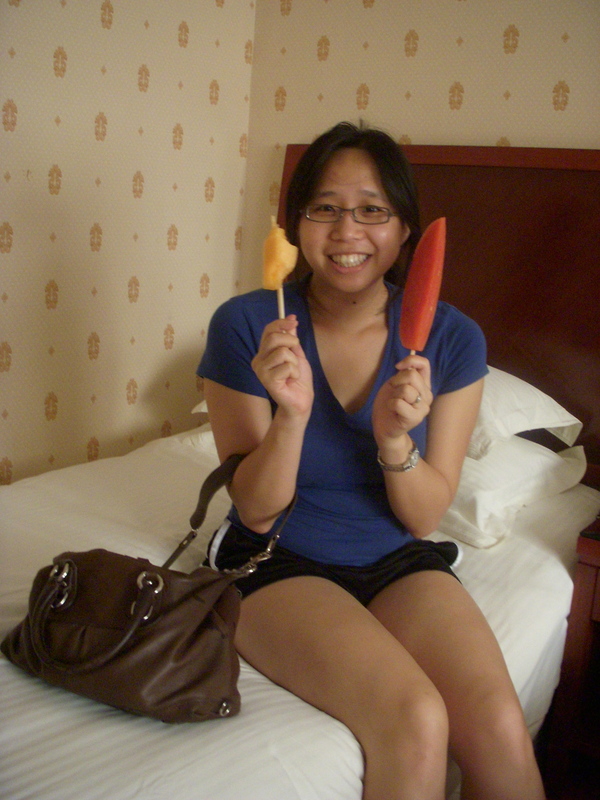 The melon and watermelon on a chopstick were 2 yuan each. How fun!! !We then took a nap from 4:30pm to 9pm. Oopss. By the time we got ready and left our room, it was 3 minutes to 10pm so we ate at the place we ate for breakfast. More siao long bao!! Eggplant over rice and small shrimp wonton soup. Total cost 30 yuan.We then went to get a message about 1 block away for 88 yuan 1.5 hours foot and body message. Mom kept asking them questions while I closed my eyes and just relaxed. Once mom told them that she will tip them more, they stopped trying to sell us products, haha. It ended at 12:10am and we headed home and got on the internet. And now it’s almost 3am so time to go sleep and go to Nanjing tomorrow!! !